If you’re watching the Senior Bowl today (2:30pm EST) post your thoughts in the comments section. I’ll update with notes throughout the game. Tyus Bowser (LB, Houston) had the first tackle of the game, working nicely in space. His second snap sent him downfield in coverage. Mike Mayock compares him to Haason Reddick — Bowser is one to watch for Seattle. The first North drive stalls after Alex Anzalone (LB, Florida) blows up a screen. He’s an underrated player and highlights the depth at linebacker this year. On the first drive for the South we get a first glimpse of Obi Melifonwu (S, UConn). He’s playing safety and destroys Donnel Pumphrey after the RB squirts into the second level. Melifonwu levels him with a crunching hit. He recovered a Matt Dayes fumble shortly after. Zay Jones (WR, East Carolina) makes a really nice catch for 14-yards working against Marquez White (CB, Florida State). White has 32-inch arms, monitor him. Jones had a good week and did well to make the grab because the pass-placement wasn’t great. Eddie Vanderdoes’ jersey and pants don’t fit. Dan Feeney (G, Indiana) wiped out Carlos Watkins (DT, Clemson) on a run play. On the next snap he did a great job getting to the second level finding a linebacker to block. Nice start for Feeney. Taylor Moton (T, Western Michigan) gave up a play to Tanoh Kpassagnon (DE, Villanova) and had to resort to tackling him. Clear holding penalty. Great quickness from Kpassagnon. There are no replay challenges at the Senior Bowl, which is a shame. Zay Jones just made an incredible play at the back of the end zone, extending fully to high point a wayward overthrow and somehow get two feet down. Sensational catch but was called out of bounds. Jones is having a day. Moton had two flags in the first quarter. The second was for hands to the face with Bowser and Dalvin Tomlinson (DT, Alabama) sharing a sack on the play. Tough start for Connor McDermott (T, UCLA) too. A flag for a false start and giving up pressure on a couple of occasions. He’s very tall and struggling with leverage. Haason Reddick (LB, Temple) played exclusively in coverage in the first quarter. O.J. Howard (TE, Alabama) finishes the quarter with a nice catch down the seam. The second starts with Jamal Williams (RB, BYU) catching a pass and getting absolutely decimated by Jordan Herdman (LB, Simon Frazier). Huge hit. Lorenzo Jerome makes another nice play. He has contain on an end-around. Although he semi-whiffed the tackle, he fought back to force a fumble by Josh Reynolds (WR, Texas A&M). Zay Jones has a second touchdown ruled out, this time for an offensive facemask penalty on the center. He locates a deep ball, tracks it in the air, shows terrific body control and completes the catch in the end zone. Jones is the star of the game so far. Montravius Adams (DT, Auburn) pushed people around all week during drills. He’s playing well here and creating constant pressure. On the next snap Zach Banner (T, USC) and Adam Bisnowaty (T, Pittsburgh) are easily beaten by Tyus Bowser and Jordan Willis. Both rushers hit the QB at the same time forcing a fumble that is comically recovered by Banner. The defensive lines are dominating the offensive lines. Which shouldn’t surprise anyone. The best athletes vs big bodies. That’s all it is in college with a few exceptions. And it shows up when we do the TEF studies. There’s an O-line problem in football. Bowser is looking good so far. If you want a Reddick alternative, here’s your guy. O.J. Howard says during an interview with the NFL Network that he wants to run a 4.58 at the combine. David Webb (QB, California) has looked the best at quarterback so far. He threw a nice mid-level touchdown to Josh Reynolds. He then throws a nice fade on the 2-point attempt but Reynolds bobbles the football. Antonio Garcia (T, Troy) had nice pass-pro on the original score. Bisnowaty, who didn’t have a good week, struggles vs Tanoh Kpassagnon and gives up a pressure before the two-minute warning. In fairness, on the next snap Bisnowaty did a much better job and shut down Kpassagnon. Reddick ends the half rushing the edge for the first time today. Jordan Willis gets the final big play of the half, destroying Bisnowaty for another sack/fumble. Bisnowaty barely looks draftable here. Highly underwhelming start, including two early time-outs. The NFL Network tries to kick things into life by interviewing a rep from Reece’s to basically spend five minutes giving a hard sell for their product. “Thanks for all the awesome candy this week” is the way the interview ends. Great play by Melifonwu to clatter Pumphrey again. He closed from distance, great speed and a nice fit. Connor McDermott continues to struggle. This time he gives up a sack to Derek Rivers (Youngstown State). David Webb comes back on the next play with a fantastic throw for an improbable first down to Fred Ross (WR, Miss. State). Webb is easily the best QB we’ve seen today. The throw gives the South team some momentum. Matt Dayes has a really nice 15-yard run (ended by a good tackle by Melifonwu) and scores on the next play. After the early fumble, Dayes looked sharp on this drive. In the red zone, the North run the ball three times and decide to kick a field goal, trailing by 13 points. Yes, John Fox is coaching the North team. Mike Mayock lists Haason Reddick, Obi Melifonwu, Rasul Douglas and Zay Jones as big winners on the North roster this week. Another possible Seahawks target, Carroll Phillips (LB, Illinois) gets a sack before Antonio Pipkin (QB, Tiffin) throws a pick to Brendan Langley (CB, Lamar). Jordan Willis has had a big impact in the game. He just beat Julien Davenport (T, Bucknell) easily to hit the QB. On the next snap he bull-rushed Davenport and just pressed him into the quarterback. Davenport is overmatched against a player like Willis. Zay Jones continues to make plays. On offense he has been the big winner today. He starts the fourth quarter with a nice completion off play action and then picks one off the turf with his fingertips. Nice play by Alex Anzalone to chase down an underneath throw on play action. Great range and instinct. Wow. Montravius Adams just had a fantastic get-off to collapse the pocket. At the same time, Kpassagnon destroys Julien Davenport off the edge and forces a sack/fumble. Adams scoops it up for the turnover. A play started and finished by Adams with a really good example of Kpassagnon’s upside sandwiched in-between. Matt Dayes has flashed in the second half. He’s not the biggest back but he’ll have a shot to make a RB rotation at the next level and contribute. Nice burst here and showed some toughness plus quick feet. Lorenzo Jerome has his second pick of the game after a terrible throw/decision by Pipkin. Just awful. On the next play Hunt has a mini-beast mode run. Nice cut, breaks a tackle, makes a move, keeps the legs churning. Impressive second half for Hunt with over 100 yards. Dion Dawkins (T/G, Temple) just dumped Duke Riley on his backside. In the red zone and trailing by seven, the North team throws it to Zay Jones. Nice underneath route, contested catch. Jones has been superb today. The player of the day. The two-point conversion fails and the South are set to win 16-15. To wrap up, here’s Mike Mayock’s top performers in Mobile. Pete Carroll mentioned ‘linebacker’ as a need in his end of season press conference. Defensive backs. Offensive linemen. That was expected. Linebacker? Don’t they have Bobby Wagner and K.J. Wright? Didn’t Mike Morgan start 29% of the snaps some of the time and as little as 5% in other games? It’s currently Mike Morgan, Kevin Pierre-Louis and Brock Coyle. One of these three has to play. Would they like to play more in base or just feel more comfortable when they do? Looking at the linebackers potentially available at #26 compared to some of the other need positions, it might be the best chance to draft a core impact player. Production, elite athletic profile, great character, outstanding Senior Bowl week. The Seahawks will be lucky if he lasts until pick #26. He has unique length and great size. He had 16.5 TFL’s in 2016 as a pure linebacker (and he doesn’t rush like Reddick). He should be gone in the top-12 and could be the next Wagner or Kuechly. Gators LB coach Randy Shannon said Davis has the competitiveness of Jon Vilma, the athleticism of Jon Beason and the football knowledge of Ray Lewis. DC Geoff Collins told me that Davis’ “desire, drive and willpower are at the highest levels there is. Every rep he takes at practice or in a walkthrough is at a game-level focus. He’s as intense of an individual as I’ve ever been around and one of the highest character kids as well.” The 6-2, 240-pounder has timed in the 40 in the mid-4.5s and done 318 pounds in the clean and jerk. If he is capable of running in the mid-4.5’s as suggested above, that’ll be similar to Luke Kuechly (4.58). Davis is listed at 6-2 and 238lbs, Kuechly is 6-3 and 242lbs. He is an explosive athlete who has sideline-to-sideline range and an internal GPS for the football. Although he needs to add bulk and improve his point-of-attack skills, Davis is a name we’ll hear a lot next fall as a prospect. “Space” linebackers such as Davis are coveted in today’s NFL. For the Seahawks it might be harder to define this position with a specific physical profile. Bobby Wagner was a 4.4 athlete, Kevin Pierre-Louis ran a 4.51 and jumped a 39-inch vertical. Bruce Irvin is/was a freak. However, K.J. Wright ran a 4.75 at the 2011 combine with a so-so 32-inch vertical. In his case length (nearly 35-inch arms) was the unique aspect he offered. Navorro Bowman, one of the best linebackers in recent years, ran a 4.77 at the 2010 combine at 6-0 and 242lbs. He improved it to a 4.62 at his pro-day. Across the league, there are varying physical profiles among the NFL’s best linebackers. Another name? How about Houston’s Tyus Bowser. He had a really nice Senior Bowl. He’s 6-3 and 244lbs and possibly as twitchy as any other player in this draft. He might’ve had the play of the week in Mobile beating Antonio Garcia in the OL vs DL drills. It was like a scene from the Matrix. His ability to lean and dip while retaining balance and finishing was exquisite. That, ultimately, is what the Seahawks need. An impact, early starter. While Davis is more of a traditional plug-in-and-play OLB, Bowser has the potential to be a dynamic SAM/LEO. It’s worth debating different options. You might think a great cornerback or offensive tackle would be a better pick. What if that player isn’t available? That’s what we have to consider here. We have a month to kill until the combine. We have plenty of time to talk about different options in round one. Nobody has had a better Senior Bowl. When we mocked him to Seattle in round one in December, there was a mixed reaction. Today, it seems pretty unlikely he’ll even last until the #26 pick. Play recognition, quickness to close on the ball-carrier, cover skills, the ability to play the edge and rush the passer. He’s highly impressive. He has similar size to Ryan Shazier with the athleticism to match. Shazier was the #15 pick in 2014. That’s starting to feel possible for Reddick. At the end of the 11v11 drills he was interviewed by the NFL Network. He spoke really well. Teams are going to love his physical profile, incredible production, character and versatility and stamp him firmly in the first round. It’s safe to say, the Seahawks will be lucky to get him. I had several scouting friends of mine asking me if I had seen Reddick. I had and loved what I saw. At 6-foot-1 and 237 pounds, he rushed the quarterback, where he’s comfortable, and showed he could play in coverage, both in man and zone. And in team drills he was everywhere. For a guy most consider a “tweener” he made a big statement on Wednesday. He’s an ultra-versatile player. Top-20 pick? Looks that way. At the end of day two Daniel Jeremiah and Mike Mayock picked their two best performers. Mayock unsurprisingly went with Haason Reddick. Jeremiah picked Connecticut safety Obi Melifonwu. He’s an intriguing player. If you missed the piece we did on him in November, check it out. Melifonwu measured at 6-4 and 219lbs in Mobile with 32 5/8 inch arms. He’s expected to have an insane workout at the combine, with many touting a 40-inch vertical and a possible 4.4 forty. Considering his size, length and athletic profile, would the Seahawks be interested? And if so, how would they use him? The Seahawks tried this type of role with Brandon Browner in pre-season. Generally they handled tight ends a lot better in 2016 — but adding a player capable of playing in the slot, outside or backing up the two safety’s might be intriguing. Plus he has the complete physical profile they look for. He’s big and lean with ideal length. He’s a superb athlete. He has the +32-inch arms. He’s the type of athlete they’ve drafted in the first round previously. If the likes of Reddick, Garett Bolles, Ryan Ramczyk and Zach Cunningham are off the board — it could be an option at #26. Keep an eye on his three-cone and short-shuttle times at the combine. The idea of Melfionwu being a defensive chess piece is exciting — but it’s also a project and a gamble. Byron Jones worked for Dallas but there’s no guarantee lightning will strike twice. And while Haason Reddick looks like a relatively straight forward plug-in-and-play linebacker with impact potential — Melifonwu’s success would depend on his ability to forge a role creating a high ceiling, low floor situation. Douglas was a playmaker in 2016 with eight picks. The Seahawks need to force more turnovers next season and he could easily be on their radar. Keep an eye on him at the combine among a loaded group of underclassmen. A quick note about the end of the North practise today. Chicago coach John Fox called the players into the huddle and read out the schedule for tomorrow. After he’d finished he called out Dan Feeney (G, Indiana) specifically to end the meeting. Little things like this are worth paying attention to. Leadership is important and the players reacted positively to Fox’s announcement. Feeney is all business. He’s not a flashy player but he’s destined to be an extremely competent right guard for someone at the next level. A number of injuries on the south roster hampered today’s practise, with a collection of late arrivals filling in. Eddie Vanderdoes continues to impress. I wasn’t a big fan during his time at UCLA. He always looked out of shape, badly conditioned and he struggled to live up to his previous recruiting hype. He looks a bit lighter in Mobile and could stand to lose another 10-15lbs. He jumps between out of control and really refined and quick. It’s boom or bust but you can live with that. At least he’s showing a flash. When he’s on it he has a devastating get-off, shoots the gap and he can penetrate. Other times he’ll end up with his face in the dirt. Coach him to be more controlled and in a year or two he could be a nice rotational piece to a D-line. Alabama’s Dalvin Tomlinson looked good again in the OL vs DL drills. He had his way with recent call-up Eric Smith from Virginia. LSU linebacker Duke Riley flashed some nice closing speed and recognition in the 11v11’s. It’ll be interesting to go back and watch more of his tape. Cal quarterback David Webb also showed a really nice touch and accuracy. He’ll be a nice project for somebody. I spent a bit of time going back to focus on Houston linebacker Tyus Bowser after the second practise concluded. If Haason Reddick is off the board before Seattle’s pick, Bowser might be a nice consolation prize. He’s better in space/coverage than I expected after watching a game tape. He didn’t necessarily show that in Mobile during drills — but there’s something to work with. We saw the damage he could do as a pass rusher on Wednesday, demolishing Antonio Garcia with a superb bend. It was like watching the Matrix the way he dipped, retained balance and finished. His get-off and explosion were top notch. He’s in tremendous shape and looks like a great athlete. He’s slightly bigger than Reddick at 6-2 1/2, 244lbs and with 33-inch arms. That’s Bruce Irvin-type size and the expectation is he’ll have a great combine. We’ll see how much his stock grows in Indy but don’t be shocked if he’s firmly in the second round range at least. He’s nowhere near as polished as Reddick — but that’s no surprise. Physically they might have similar ceilings. If you’re wondering why Pete Carroll noted ‘linebacker’ among Seattle’s needs and desires in his recent press conference — here’s why: Haason Reddick, Tyus Bowser, Zach Cunningham are three reasons. There a quite a few others too. This is a good looking class of linebackers and worth tapping into. Really starting to come together for Haason Reddick/Temple. Unstoppable in blitz drills and it's clicking in coverage drills. Look at the twitchy quickness he shows attacking space, the way he throws off the fullback in the second clip and the impressive inside swim move to defeat Adam Bisnowaty in the DL vs OL drills. Don’t be surprised if he leaves Mobile ranked as a possible top-20 pick. He could go in the top-25 and if not — he could be an option for the Seahawks at #26. He’s an impact player with supreme athleticism. Is linebacker Seattle’s biggest need? Perhaps not. But if the top offensive tackles are off the board and the top cornerbacks are gone — it’s a strong option. A reminder — Reddick had 22.5 TFL’s in 2016 and 10.5 sacks. He’s not just a cover guy or a third wheel that’ll play 25% of the snaps. He’s an every down, impact player who can cover, run to the ball, blitz and play some LEO. Bolles is an elite athlete but Asiata is no slouch. There aren’t a ton of viable O-line options for the Seahawks in this draft but they could do a lot worse than double down on these two. They’re tone-setting linemen. Physical, nasty, mean, play with an edge. It was interesting to go back and watch the Utah vs Washington game again yesterday. Asiata arguably had the better game against a loaded Husky D-line rich in NFL talent. There’s every chance Bolles will end up being a top-20 pick and it’ll be out of the Seahawks hands. He has to remain on the radar for now, just in case. Seattle might not be in the market for a left guard but Asiata is also worth monitoring at the combine if he’s healthy. Lamp received a lot of positive feedback for his one day of drills at the Senior Bowl. Personally, it was hard to shake the way he was absolutely rag-dolled by Tanoh Kpassagnon and beaten with a quick swim move by 320lbs Eddie Vanderdoes. He handled his business apart from that — but he’s not coming up against big-time prospects in Mobile. If Kpassagnon can do this (see below) to Lamp, how’s he going to handle Calais Campbell? During the pass-rush drills it was a little surprising to watch Indiana guard Dan Feeney comprehensively beaten twice. He had a really rough rep against Michigan’s Chris Wormley (beat him with a quick get-off) and was walked into the backfield on the previous play. After receiving rave reviews on day one, this was a little unexpected. Dion Dawkins had some nice reps at left guard. His lack of height (6-3) probably places him inside at the next level. He was consistently effective. Bucknell’s Julien Davenport had a nice inside-out rep, using his length (36 inch arms) to full use. His raw nature was a little exposed on the next snap when he was easily beaten on an inside counter. USC’s Zach Banner just looks too big. He lacks great mobility and had one of the ugliest reps of the day, offering an easy target for a two-handed punch that jolted him off balance immediately. On the defensive side of the ball, Illinois’ Dawuane Smoot was a bit underwhelming. Wormley and Reddick were the standouts. Tanoh Kpassagnon (DE, Villanova) had another good day. He’s long, tall and well put together. He beat Kentucky center Jon Toth working inside, had a nice rep sailing by Antonio Garcia and had a spin move to get off a block by the right tackle on one rep. If UCLA’s Eddie Vanderdoes gets in his best shape he could be quite an effective player. He’s 320lbs but could probably lose another 10lbs. He frequently plays out of control but every now and again he flashes a really quick inside rush. The Troy tackle Garcia is not having the week so far that many anticipated. He looks very raw and his lack of size (293lbs) shows too. He had the rough rep against Kpassagnon but was also well beaten by Houston’s Tyus Bowser (it was admittedly a very good rush by Bowser). Alabama defensive tackle Dalvin Tomlinson is going to make a really good pick for someone. Powerful, jolting interior lineman. He looked really good today. Kansas State’s Jordan Willis failed to flash in the NFL Network footage shown. He’s their type of player — relentless, understated, he’s faced adversity and he’s a tremendous athlete. There were some concerns about his size but not any more. Today he measured at 6-1 and a half and 236lbs. That’s big enough for a versatile outside linebacker. At his junior pro-day, Reddick reportedly ran a 4.47 forty, jumped a 10-10 in the broad and a 36-inch vertical. He also had 22.5 TFL’s in 2016 and 10.5 sacks. Explosive, quick-twitch athlete. Great flexibility with loose hips to turn, twist, and chase. Excellent reactive quickness and change-of-direction agility. Dynamic playmaker in space. Locks onto targets and instantly accelerates to the ball. Has athleticism in space and necessary instincts to be legit cover talent as linebacker. Rushes with good bend and forward lean. Difficult to handle on tackle/end twists back inside. Turns corner with tight track to quarterback once he pries the edge open. Zierlein compares him to Pittsburgh linebacker Ryan Shazier. He likely won’t reach Shazier’s freaky levels of athleticism (42 inch vertical!) but he won’t be far behind. Linebacker isn’t the biggest of Pete Carroll’s admitted key needs (secondary, O-line, linebacker) but consider this: what do you do if the top two offensive tackles (Bolles & Ramcyzk) and 4-5 of the best cornerbacks are off the board? Riddick’s an intense, impact defender on a defense needing a couple of extra dogs. Sadly, it won’t be a surprise if he rises into the top-25. There are different heights among this group. Thurmond is 5-11 but Richard Sherman 6-3. The one consistent feature is arm length. Today only Rasul Douglas (CB, West Virginia) and Marquez White (CB, Florida State) topped the 32-inch cut-off. Is it possible they make an exception for the right player one day? Sure. Tre’Davious White in particular is a really good corner and he’s nearly at 31.5 inches. If it was to happen though, he’d be the first cornerback in seven years they drafted with sub-32 inch arms. That’s a trend you can’t ignore. The Seahawks have a need at tackle. Generally teams like their tackles to have +34 inch arms for obvious reasons defending the edge. Seattle’s recent three first round O-line picks hit the mark. Russell Okung and Germain Ifedi have 36-inch arms. James Carpenter is at 34-inches. It’s not a strict theory. Justin Britt, a starter at right tackle as a rookie, has 33.5-inch arms. That might be the cut-off point. A year ago many teams viewed Kansas State left tackle Cody Whitehair as purely a guard due to his lack of length (6-4, 32 3/8 inch arms). A lot of Senior Bowl prospects are going to be judged similarly. Forrest Lamp (T, Western Kentucky) has an incredible lack of length at 6-4 with only 31-inch arms. Adam Bisnowaty (T, Pittsburgh) likely has to move inside after measuring at 6-5 with 32 5/8 inch arms. Zach Banner (T, USC), listed at 6-8 in height, only has 33.5 inch arms. Even Antonio Garcia (T, Troy) at 6-6 and considered by many to be a potential big riser over the next few weeks has 32 7/8 inch arms. Weighing in at only 293lbs won’t help either considering the concerns about his ability to add and retain weight. Why weigh-ins matter: Most players that lack the ideal Height/Weight/Length/Athleticism have failed. Its about minimizing chance of failure. If the Seahawks are looking to add a possible starting tackle this off-season, they might be relying on the underclassmen and free agency. For a full list of weigh-ins and measurements, click here. The OL vs DL drills are the best of the week. After watching the south team perform, it’s pretty clear major improvement is needed during the week. Texas A&M’s Daeshon Hall had a field day rushing the edge, winning constantly with speed and a nasty spin move counter. His first rep vs Troy’s Antonio Garcia was a mismatch. He, like everyone else it seems, also had a lot of fun vs Mississippi State’s overmatched Justin Senior. Forrest Lamp had two really ugly reps. On one play he was driven deep into the backfield by Villanova’s Tanoh Kpassagnon and then rag-dolled to the turf. UCLA’s 320lbs nose tackle Eddie Vanderdoes also beat him far too easily with a quick swim move. Considering Vanderdoes otherwise played completely out of control and spent most of the drill on the turf, this wasn’t a good look for Lamp. On one snap UCLA’s Conor McDermott gave up an easy inside rush, looking tired and lethargic. At his size you have to play inside-out and use your length. He offered a nice big lane for the pass rusher inside. A gift-wrapped sack. Ethan Pocic is 6-6 and playing center, so it was no surprise he struggled to win with leverage and was twice walked into the backfield. Montravius Adams of Auburn had a really good drill pushing the pocket consistently. — Haason Reddick (LB, Temple) measured nicely at 6-1 4/8, 237lbs with 32 1/8 inch arms. He is an early round option for Seattle, possibly at #26. — Rasul Douglas (CB, West Virginia) passes the 32-inch arms test, as does Marquez White of FSU. — Cam Sutton (CB, Tennessee) has 29.5 inch arms at 5-11, 182lbs. Ouch. Tre’Davious White (CB, LSU) at 31.5 inches. — Antonio Garcia (T, Troy) only weighs in at 293lbs amid concerns he struggles to retain weight. This is very light for a NFL tackle. He also only has 32 7/8 inch arms despite being 6-6. — Dan Feeney (G, Indiana) measured well at 6-4, 304lbs with +10 inch hands and 33-inch arms. The following players declined invites to the Senior Bowl: Jonathan Allen, Reuben Foster, Jordan Leggett, Deshaun Watson, Mike Williams, Corey Davis, Taco Charlton, Dede Westbrook, Pat Elflein, Wayne Gallman, Kevin King and Cordrea Tankersley. Some of these players are carrying injuries. Chidobe Awuzie will not participate due to a toe injury. Takk McKinley is also out with a shoulder injury that may require surgery. Eddie Jackson, Chad Kelly, Seth Russell and Marcus Maye are also hurt but are in Mobile to meet with teams. Remember — the key for Seattle is 32 inches for an outside corner. There may be wiggle room (31.5?) in the slot. 32 1/8 arms. 10 3/8 hands. Looked awesome. The Senior Bowl practises begin on Tuesday (1:15pm EST) with workouts until Thursday and the game taking place on Saturday (1:30pm EST). Can he shine against good competition? He certainly did it for Eastern Washington. It’ll be interesting to see if that translates here. How does he measure? (Height, arm length). He was a turnover machine at WVU in 2016, can he flash in practise and make a big play in Saturday’s game? He’s not big — so how does he measure? His production regressed in 2016 so can he regain some momentum here? Big things are expected of Melifonwu at the combine. Let’s see it. Stand out in practise. It’d be nice to see some physicality too. How big is he? The Senior Bowl game is a good platform for runners. The combine will be bigger for Hunt. It doesn’t look like he has a second gear on tape. The trench warfare in Mobile is the most entertaining part of the week. OL vs DL. Wormley has the length, size and quickness to excel. Will he work out completely at linebacker or will he get some EDGE work too? Can he shine like Deion Jones a year ago? How big is he, officially? A big tackle with a lot of potential. O-liners can do a lot for their stock in Mobile. Dawkins could jump significantly with a good week working against guys like Dawuane Smoot. Does he get any looks at tackle? How long are his arms? Can he perform as consistently well here as he did on tape? He’s really good. Arm length. Big key here. Bisnowaty also has a chance to work at tackle and guard this week and flash. The Senior Bowl is always big for OL vs DL. Small school talent — can he show he belongs while playing next to some big names. How big is he? Is he as big as advertised? Does he struggle with leverage during drills? His get off is so quick on tape so let’s see some dynamic EDGE rush in practise. Explosive on his day, let’s see if he can get off blocks too. His brother had a great Senior Bowl and really boosted his stock. Let’s see if Ryan, a defensive lineman, can cause these big name O-liners some problems. Really strong interior rusher coming off a decent season. This is a great stage to promote his talents. Can he flash quickness? How good is he? Some people really like him. I’ve always felt a bit ‘meh’ watching him. Here’s the chance to impress. He looks like he was born to play in the AFC North. Will the other players gravitate to him as you’d expect? Can he continue to stand out? He has first round potential. Let’s see how big he is first and foremost. Can he make a big play in the game? All he did in college was make plays. With a few rising stars in this TE class, Engram needs a strong week. Catch everything. Just a really good player — he has an opportunity to confirm his status as a first round pick. He’ll catch Mike Mayock’s eye. Underrated, tough as nails running back. How big is he? Can he continue to run hard and have a big day in the game? Every single week he made plays for ‘Bama. Can he continue that here without the star-studded supporting cast? Length, length, length. This is all about the arm length. +32 inches and he could be on Seattle’s radar. He’s a dynamic player with a great personality. Is he healthy? Could be the star of the week if he performs. There’s always one tackle who emerges in Mobile. Garcia is smooth in pass pro but needs to be nastier as a run blocker. He was essentially Jarran Reed in 2016 for ‘Bama. Can he flash some pass-rush moves this week? Good player. How long are the arms? Can he have a big impact during pass-rush drills? This is a nice test for him against the South O-liners. Does he get snaps at tackle or just guard? Can he live up to the increasing hype? It’ll be fun to watch him next to Antonio Garcia if he plays some left guard. He’s listed at like 6-7 — is that accurate? And if so, where do they line him up this week? Dominate. Keep blocking well, catch some passes. Howard is a first round pick and can prove he’s a class act here. Catch every pass. Seattle-born pass-rusher who had big games and quiet games at A&M. How long is he? Can he have a big week in drills? He had a big year in terms of production but the tape is a bit underwhelming at times. Can he shine in the OL vs DL drills during the week? 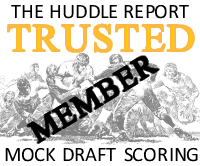 I’ve posted a mock draft on Field Gulls today with some thoughts on the pick and some notes on possible targets between rounds 2-7. Check it out and let me know what you think. Yesterday both Daniel Jeremiah (NFL.com) and Mel Kiper (ESPN) posted mock drafts. Let’s have a look at both and which players were available to the Seahawks. Bolles looked like the best offensive tackle in college football in 2016. He’s the complete package — with the intensity and physicality to dominate in the run game, the agility to progress to the second level consistently and latch onto linebackers and safety’s in space and the loose hips and footwork to be effective in pass-pro. He will be 25 in May but should be able to start quickly at right tackle. Here is a strong example as to why this is a really interesting draft class. 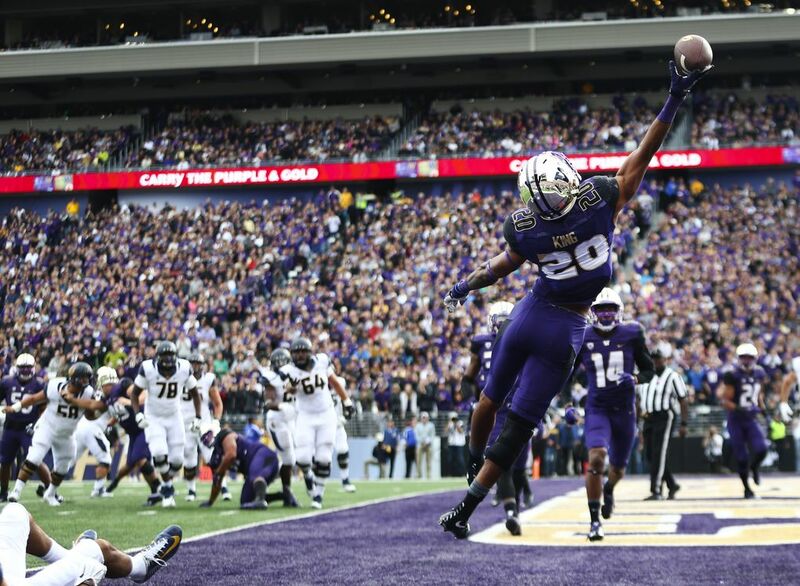 If the Seahawks were able to pick from this crop as well as the likes of Kevin King, Gareon Conley and others — they’re going to get an impact player. With so many options available they could feel confident moving down (an increasingly likely scenario after yesterday’s report that Seattle could forfeit its second round pick). According to Jeremiah’s mock, they could move down into the early 30’s and get one of Peppers, Humphrey, Baker, Cunningham or Jackson. It’s very early in the process and it’s likely Baker, Cunningham and Bolles will rise in the national media and find a place firmly in the top-25. Still, this will reassure fans disappointed with yesterday’s news about the second rounder. Tankersley is a reasonably sized corner. The key is going to be length and athleticism. If the Seahawks take a corner earlier than the fourth round for the first time in the Pete Carroll era, it isn’t going to be a ‘decent’ athlete. It’s going to be someone who tests off the charts. One of the reasons Kevin King is a possible pick for Seattle is his incredible testing potential. At the Husky combine last year he ran a 6.40 three-cone. If he repeats that at the NFL combine, it’ll be the best three-cone ever by any player. The current record is a 6.42 set by Jeff Maehl. Tankersley will need to prove he has an exceptional ceiling. Example #2 of the overall strength of the draft. It’s highly unlikely Sidney Jones lasts into the 20’s. He’s too good. Teams just avoided Jones all year — you don’t see a cornerback on tape avoided like him. He has enough size and quickness, plus a natural playmaking style, to warrant a top-15 grade. Cunningham and Jackson are available again but unlike Jeremiah’s mock — Budda Baker, Marlon Humphrey, Garett Bolles and Takk McKinley are gone. Again there are options to move down. Kiper has Jones at #28 while Barnett and Howard are gone before the end of round one. Dropping into the top of round two would still give them a shot at Cunningham and Jackson while Tre’Davious White, Gareon Conley and Kevin King are also available. It’s still way too early to say — but there are at least some logical candidates to research and monitor at #26. These players are chosen based on needs (per Carroll) and possible fit within this team specifically. Likely a top-20 pick due to the demand for good offensive tackles but possibly lasts if the age-factor puts some teams off. Check for his arm length at the combine and how he fits into TEF. It’s OK to look the part — but with only one year at Utah he needs to prove physically he’s ready for the NFL. He ran a 4.35 at the Husky Combine, a 6.66 three-cone and a 4.08 short-shuttle. His long speed and short-area quickness are impressive. His ability to potentially play slot, a hybrid role and cover free safety might appeal — plus he carries himself like a Seahawk. The only issue is size and length — especially if the Seahawks intend to use him primarily in the slot. His size will be key and he can’t measure too small even as a slot corner. Can he get to 5-10 and 194lbs like Chris Harris Jr? Has he got Harris Jr’s length (33.5 inch arms)? If they’re happy with his size/length — Jackson is the type of explosive athlete they like with incredible character skills. Incredible athlete with supreme length and size. Let’s run through what he achieved at the Husky combine again — a 4.02 short shuttle, a 6.40 3-cone, a 39.5 inch vert and a 10-10 broad jump. If he gets anywhere near this type of performance at the NFL combine — he will be the talk of the final day. He won’t run a fantastic forty so he has to show great short-area quickness. He’s just a Seahawks type of linebacker. Freaky length, great athleticism, plays the run well and has an intensity to his game. He racked up TFL’s in 2016 and set the tone on Vanderbilt’s defense. Carroll noting the desire for younger competition at linebacker (and possibly an upgrade at the SAM) makes Cunningham a decent option if the better cornerbacks and O-liners are gone. Can he run in the 4.4’s? Nobody is talking about Reddick as a top-45 type of player but he has a supreme combination of size, athleticism, versatility and grit. In many ways he looks like a Bruce Irvin clone — with the college production to match. Don’t sleep on him as a potential high pick by this team. Especially if he tests as well as Irvin at the combine. Someone who could really make some money at the Senior Bowl and combine. In a weak tackle class at the top end, Garcia appears to have the athletic skill-set of a high pick. How he performs in Mobile will be crucial. Accurate measurements and TEF via the combine will also determine his fit. The Seahawks have drafted for size on the O-line recently and Garcia is listed at 6-7 and 302lbs. He’s said to have great range and athleticism — plus he has +34 inch arms at 6-4 and 223lbs. He has the length — if he tests well too he could be on Seattle’s radar. In many ways he fits the profile of a potential Seahawks corner. He has +33 inch arms on a 6-1, 203lbs frame. Long speed is considered an issue but we’ll see how he tests in Indianapolis.